The cover of Marion Frost's scrapbook -- simply, yet elegantly bound, this document serves as an artist's portfolio that showcases Frost's photography and artwork. 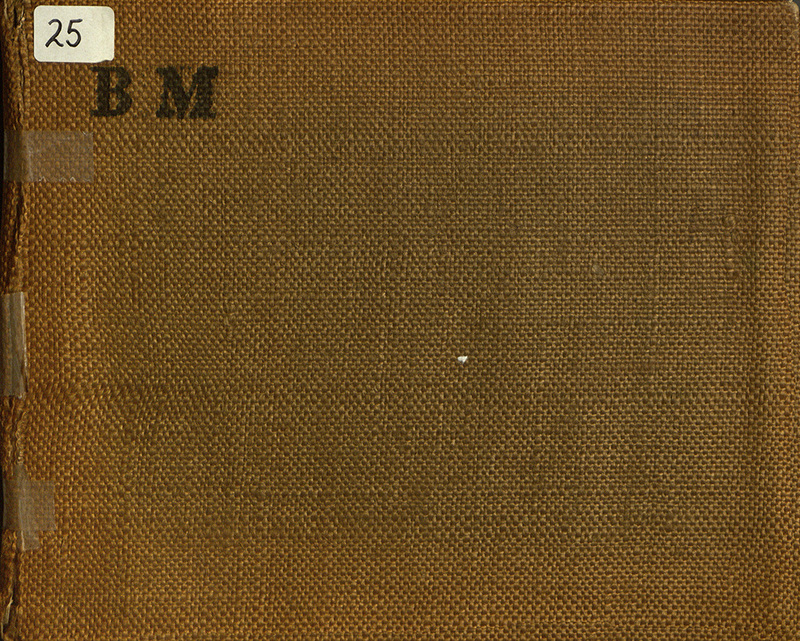 Stenciled on the cover of Marion Frost’s scrapbook are the letters “BM” that indicate that it’s contents comprise of materials that pertain to the college. Indeed, this scrapbook serves to memorialize the aesthetics of the campus: the architecture, the students, and the attention to the fine detailing of the building. While images of the campus take up the majority of the scrapbook, mementos such as a signed photograph of M. Carey Thomas and a Bryn Mawr College College Endowment cartoon also share the space curated by Frost. Though these pieces are significant, they do not seem to highlight Frost’s personal life at the college in any way. Rather, they serve to reveal threads of the stories that influenced Frost in her endeavour to capture campus life through her camera lens and pencils. In addition, Frost was cognizant of the layout of each of her pages – choosing to arrange the photographs and memorabilia in her scrapbook in a way that allows the viewer to fully take in each image. The pages are simple and streamlined; the contents of each are extremely well-organized and free of clutter.